This lens corrects colour aberration with four low-refraction, low dispersion UD lens elements. It makes good use of available light for sharp, clear imaging performance. The ring-type USM and inner focusing system deliver quick and quiet autofocusing. Operability is enhanced by the full-time manual focus system as well as the possibility of autofocus at 98-280mm f/4 or 140-400mm f/5.6 when used together with the Extender EF1.4xII or EF2xII. 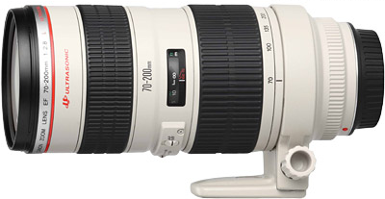 NOTE: When the EF1.4xII or EF2xII Extender is attached to the EF70-200mm f/2.8L USM, the AF function on multi-focus-point EOS cameras is limited to the center focus point only.